Home / Blog • Featured / weekend round up of challenges! A busy weekend again all round! This time it kicked off with a Bike Handling session on the Saturday morning and our last in the block of our Junior squad. 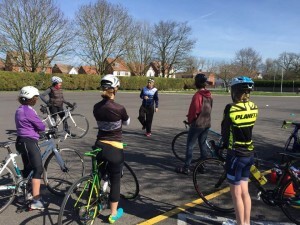 Derek and Sharon were on form with the juniors developing their bike handling skills, running transition work, and finishing with some hard training in the pool. Ade and myself worked with a great group of highly adaptable cyclists on their bike handling skills, taking them through cornering, the many skills of transition, and general handling skills. We could have spent a day on it, so we will definitely be running more! After a quick lunch, Annie myself and Russ then headed to the pool for Annies March Challenge. This time not 5k of 50s but 6k of 100m reps Didnt seem so bad for the first 4-5k then the arms really did fall off for me, but hats off to Annie, she just kept ploughing up and down that pool with no problems what so ever! Very impressed, and if you would like to support her amasing cause, her website is https://www.justgiving.com/fundraising/Annie-Bungay. Only two more challenges to go, to take it up to her target of 12 months! Awesome effort. After we finished our 6k, adult squad kicked off for an hour, and again, great to see so much progression in the pool. We had to postpone strength and conditioning, due to the necessity of building a bike that I was racing on in the morning, (far too early bearing in mind the clocks went forward as well) so a quick dash home, for Ade to get cracking with chopping down bar ends, and re arranging the cabling! The overly optimistic plan of actually being able to take the bike for a ride before racing became apparent when it was 10pm, so Ades solution to this was - sit on it to see if it will fit – sure it will be fine for tomorrow! I most certainly would never recommend this approach to trialing out a new bike, but to be honest it wasn’t a key race, and the bike section was so short it wouldn’t be the end of the world if it wasn’t perfect, but it did offer a great chance to test it out. Despite the clocks going forward, we had a few racing on Sunday. Nige and myself were at Portsmouth and David and Chris were running in the Yeovil half marathon, whilst Jenni was cycling miles in a hilly Sportif with some friends, somewhere in the North of England. Great day for it, Spring is finally here! Though I think we could have done with out the wind, running and cycling up and down the sea front in Portsmouth. This was Nigel’s first race since resuming training again at Christmas, and he certainly didn’t disappoint. He has been going from strength to strength each week, and smashed his pbs in his run and bike section of the course. Brilliant effort for his first race of the season. Few more Duathlon race practice events before Staffordshire in June! Chris and David also illustrated their improving fitness and endurance, as both posted PBs in the Yeovil Half, Chris in 1:29 and David in 1:43! Top effort all round, and great prep for the IM in August!. As for me, well as most of you know, this was my first event in the best part of a year, after ligament reconstruction surgery in July. After only resuming running (still as a run walk) in January and just introducing some speed work within the last 3 weeks, I knew this would hurt and illustrate just how race unfit I was. Therefore it was really important for me to go in with a clear strategy to avoid that disappointment of not being able to keep up with the front end of the pack. This was hard and brought home just how patient I need to be this year. Both runs as predicted started with a hobble, I do not know exactly why, but it takes a while before the ankle strength kicks in. However this has already decreased from 10-15 mins to about 5 mins now, so we are getting there! As for effort, wow, just lacking any speed in my legs. I’m not sure why I would think I had any, but that competitiveness just takes hold, and the body wasn’t playing! Loved taking the bike for its first spin, definitely handles differently from the previous Exocet, but the EXO3 is a great bike and looking forward to some longer rides on it. Transitions, again, a challenge with the ankle, the strength isnt there yet, and I hobbled on to the last run, and was over taken on the last section pushing me to 4th from 3rd though winning the Vets, which of course I wasnt happy about, but it is what it is. So, what have I taken away from the race?? Well, it illustrates the importance of Process Goals. Did I achieve the “process goal” of the session?. Yes I did. I finished, uninjured, the ankle is still weak, and not 100% BUT its getting there, and I have not damaged it, I have no other niggles, and once warmed up, it seems to function just fine. Am I race fit? Far from it, and this frustrates me, but this comes from consistent training with quality work, and lets be honest, that has not been on the agenda the last 6 months. So, what now? Well, I need to develop strength in this ankle, I am working muscles I have not used as its changed my running style, which means the calf and foot fatigue quickly, so more strength work, and consistency in training. Also, just putting myself back out there on start lines to develop that quality work. Accept that its going to take a while, approach races with different goals rather than winning this year, as that will lead to disappointment and actually I would argue it is an unrealistic goal at the moment. Patience has never been my strong point, but this last year has certainly been a lesson in being sensible and patient, and recovery and rehab is actually going well, so I am not going to take risks now. I should perhaps add at this point that although it sounds like I am a sensible, rational athlete, well I have had my moments!…..and this is where Ade, coach / husband has actually kept me on the right path rather than the destructive one, which I have been known to head for at times. If Im honest, I was pretty grumpy for a bit after the race on Sunday, I hate being over taken, and I was so far off my run splits from before injury and surgery. But when I put on my sensible head, and listen to the advice, its not so bad. We will continue to develop the training together with the support of Hands on top physio Joe who is constantly letting me know what I can / cannot do and come the end of this season / 2018 Im hoping to be going a lot faster! So, next week Goodwood. A slight increase in distance so we shall see how it copes with that! Anyone up for joining me? A lot more fun when you are with other people!